It’s not unusual for employees working in public organizations to feel pressed for time. With morning hours morphing into afternoon hours and Mondays into Fridays in an unrelenting, repetitive cycle, the pressure generated by juggling multiple and sometimes conflicting personal and professional demands—while simultaneously having to get work completed on schedule—oftentimes tempts employees to submit incomplete reports or fudge facts. Then, upon reviewing those reports, a public administrator discovers ethical lapses. Understanding the pressures one’s employees are experiencing and that they’re tired, distracted and perhaps feeling guilty, what’s one to do? Maryam Kouchaki’s early research revealed that unethical workplace conduct tends to increase when employees are in a state of “ego depletion.” Worn down from fatigue, physical discomfort or the exhaustion that’s associated with making personal and professional difficult choices, employees tend to make unethical decisions and engage in unethical workplace conduct, particularly during the afternoon hours. Does knowing that one’s employees are pressured influence an administrator’s perception and judgment of their performance? In sum, administrators judge intentional unethical workplace conduct as more blameworthy. They also tend to be more lenient with and rarely punish what they perceive as an employee’s unintentional unethical workplace conduct. When judging unethical workplace conduct, it’s necessary for public administrators to consider an employee’s situation and circumstances. But, Kouchaki warns, doing so risks setting a dangerous precedent: When an administrator rarely punishes ethical lapses due to ego depletion, the next time an employee acts unethically, there’s little incentive for that employee to be honest about the cause(s). As understandable as being lenient may be due to particular situations and circumstances, doing so fails to promote ethical culture in the workplace. To rectify this failure of ethical leadership, Kouchaki maintains, administrators must ensure there are consequences for unethical workplace conduct and uphold those consequences. This is how administrators can assist employees to learn from their ethical lapses and failures, even if they are small or relatively common, and promote ethical culture. As personal and professional demands increase and employees endeavor to balance the multiple and conflicting pressures, the result may be that ego depletion causes small ethical lapses increase in frequency. To deal with this challenge, the Code’s contents advocate that public administrators address the effects of ego depletion not by restructuring the workplace but, instead, by reframing those ethical “failures” as “opportunities” for employees to learn from them. 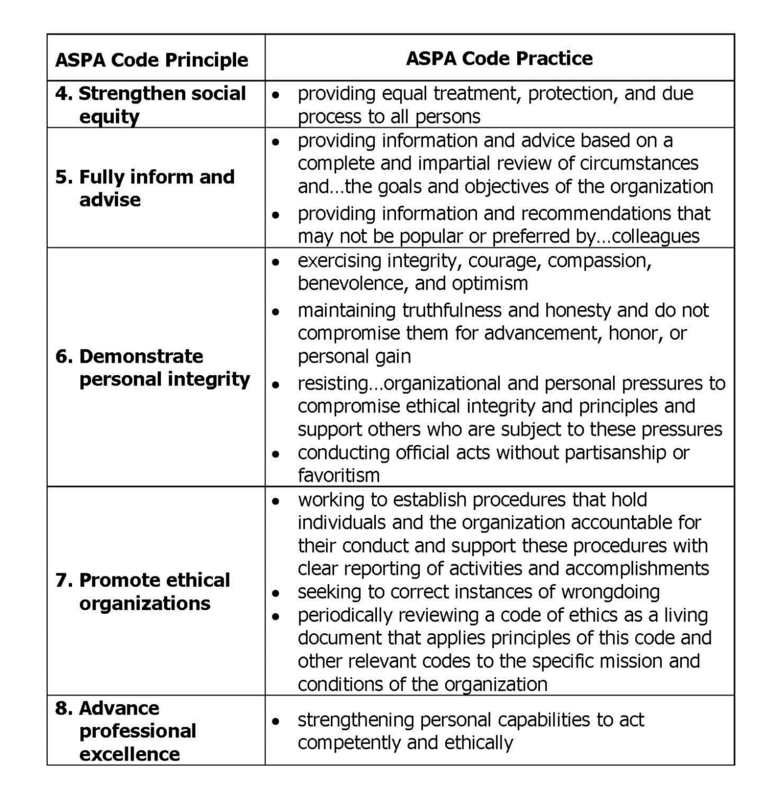 More importantly, the Code’s five principles and twelve practices offer public administrators a roadmap for addressing ethical lapses due to ego depletion by reaffirming the organization’s mission, values and code of conduct. Implementing this roadmap, public administrators will challenge employees to identify and assess the pressures they experience as well as their need to inculcate into their character and express in their workplace conduct the virtues embedded in the Code’s principles and practices. This leadership conduct—“ethical pedagogy”—evidences itself in the conduct of public administrators who appreciate and understand this crucial role. With clear perception and keen judgment, these women and men promote the development of ethical culture in the public service organizations entrusted to their stewardship.